If something is suffering the DEATH BY A THOUSAND CUTS, lots of small bad things are happening, none of which are fatal in themselves, but which add up to a slow and painful demise. The Dictator abrogated the constitution in 2009 and ever since he introduced his roadmap to democracy he has quietly made sure there will be no democracy when it comes to the 2014 election. Little by little he has acted to intimidate, to take away our rights and to create an election process heavily weighted in his favor. The result is that democracy in Fiji is dead before it has even started. Please see below a list of little cuts; None is fatal on its own but when taken as a whole it shows that the vote on September 17th will not be decided by the people but by Bainimarama and Khaiyum. The list is not complete. If you have any other little cuts you want to share add them as a comment or send a Private Message to Shazzer & Grubby. 1- The destruction and burning of the Ghai constitution. 2- One of the key things in this, the people’s constitution, was an interim government to take us to elections. The purpose was to stop the regime from abusing its position. Bainimarama was well aware of this abuse and this is why n December 2006 he said no member of his interim cabinet would stand for elections. 8- The single Constituency was imposed on the people to give an advantage to people with a national profile. The Dictator has the biggest national profile because of his control of the media. 9- The Political Parties Decree killed off all the small parties in Fiji. 11- STATE PROCEEDINGS (AMENDMENT) DECREE 2012 allows Dictator and Ministers, many of whom will be in the Fiji first Party to commit libel and slander without any liability. Normal rules apply to everyone else. 14- Ministry of Information putting all their resources behind promoting Frank Bainimarama and Aiyaz Sayed Kahiyum; leader and General secretary respectively of the Fiji First Party. 19- Fiji scored ZERO in an international survey on budget transparency. There is no way the people can know how their money was spent by the Dictator. 30- A student volunteer for an independent candidate received calls from Police Intelligence. On 27th May Police officer CID7431 Amini Ririko called to ask questions about the political campaign and meetings and at the same time intimidate the volunteer. 31- These actions clearly tell students not to support the opposition or their scholarships and loans will be terminated. 33- Threats of no development in Chiefs provinces if they do not cooperate with the regime. 34- Ro Temumu taken to QEB for questioning and kept overnight in a cell. 43- Police have had their independence removed by serving under army officers for 7 years. 47- Driti conviction important for 2 reasons. 1- Send a message to soldiers about opposing the dictator. 2- To stop him from standing in the elections and collecting a significant military vote. 52- Controlling questions in debates. When the Indonesian delegation gave a talk on West Papua students were warned not to ask questions or demonstrate in any way; even student clothing was censored. 53- Fiji Institute of Accountants has neve once questioned Government accountability. 55- FIA has never questioned Government about its ZERO score in budget transparency survey. 60- Chiefs have been forced to keep quiet. 71- NO DECREE CAN BE CHALLENGED IN THE COURTS, even after the election. 74- Madigan picked to convict Brigadier Driti. The Assessors unanimously said NOT GUILTY. Madigan overruled. 82- Soldiers have been appointed into many civilian roles. They follow the orders of their commander the dictator and not their civilian bosses. 84- Rugby is the biggest male sport; netball is the biggest female sport. Both are controlled by Bainimarama, they provide him with great campaign opportunities and platforms. Congratulations you have made it to the bottom and are obviously very interested in Democracy. As you can see democracy in Fiji is reaching a critical condition. Already we are in Intensive Care. 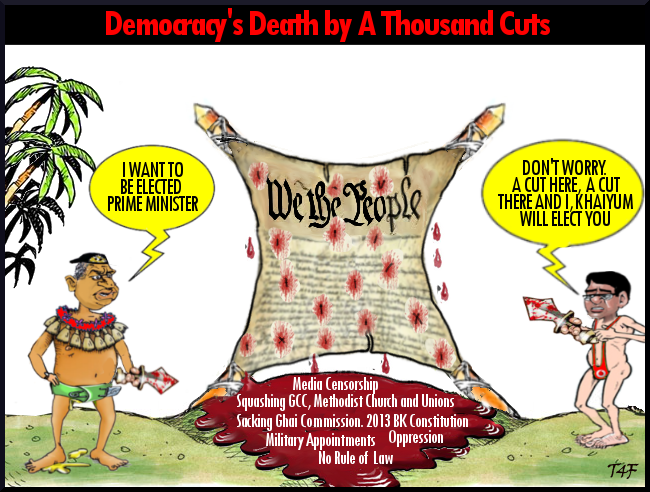 Murray McCully and Julie Bishop please take note Fiji is not advancing towards democracy. There have been grand gestures, an electoral commission, an electoral decree a supervisor of elections. But all are controlled by 1 man the GENERAL SECRETARY of FIJI FIRST, Aiyaz Sayed Khaiyum. You already know this, so pull your finger out!